Pastor Franz Rinschen, Volker Kennemann, Mark Riggleman, Suellen Griffin Valdes, Toni Wurzburg Viertel, Mary Lou Kritter Bohen, Beverly Brown, and Patricia Dombecki contributed to this story. My wife Marilyn and I took a two-week trip to Germany and Italy in March and April 2007. The first week was mostly spent visiting small towns where my ancestors lived. We flew Lufthansa from New York to Stuttgart, where we rented a small Opel. In the first few towns, we were able to see the Catholic Churches. We saw family names in cemeteries but there were no old graves. We learned later that gravesites are leased for 20-25 years, after which they usually revert to the cemetery owner (church or town) and are reused. Some gravesites are sold to a family and used for generations, but even then the site is reused within the family. Our fifth day there was a Friday. Around four o'clock in the afternoon, we found ourselves at Mariä Himmelfahrt Church in Schönholthausen, which is in a hilly section of Westphalia called the Sauerland. We had just been to the Church and seen the cemetery. The location of the rectory was not apparent. A woman in the restaurant across from the church pointed it out, and we went over and knocked on the door. The Pastor, Franz Rinschen, answered the door. I told him we were from America and looking for information about my ancestors named Drueke. "Drüecken!" he said, "I think I have something your going to like." But he could not talk because he was in the middle of preparing the parish bulletin for the coming weekend. We agreed to come back the next morning. Things were definitely looking up. At 10 o'clock the next morning, we rang the bell again and this time Pastor Rinschen invited us into his study, asked us to sit down, and began to tell us about the history he had written of houses in Ostentrop, a town in his parish just a mile from the church. He directed our attention to the Drüecke house which was owned by my great great great grandparents, Johann and Elisabeth Bitter Drüecke. The house is just to the north of the intersection of Mittelweg and St. Lucia Straße. The house, designated by Pastor Rinschen as HAUS 08, appears on pages 39-43 of his unpublished history of approximately 30 houses in Ostentrop, Germany. 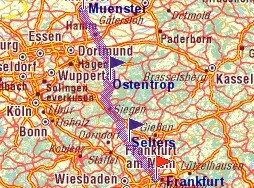 173-mile trade route of Johann Drüecke superimposed on 2007 Michelin map showing from north to south: Münster, Ostentrop, Selters, and Frankfurt. Pastor Rinschen also showed us a copy of handwritten book of accounts of Johann Drüecke referred to in his history. The book of accounts indicates that Johann was a trader. He bought cured hams from processors in the Ostentrop area and transported them by horse and wagon to Münster, 66 miles to the north, and to Frankfurt, 107 miles to the south. He also dealt in mineral water from the town of Selters (where the name seltzer water originated). Selters is on the route between Ostentrop and Frankfurt, 68 miles from Ostentrop. According to a modern-day ham processor by the name of Abraham, "The production of ham has scarcely changed over the centuries. Westphalian ham has its very own typical shape and flavour. It is salted on the bone for five weeks, then smoked for another four to five weeks over beech wood and juniper twigs. The bone is only removed after a total maturing period of two to three months: only then does the ham achieve its typically seasoned Westphalian flavor." After meeting an hour and a half in Pastor Rinschen's study, he took us to the house in Ostentrop. He drove and we followed in our car. There were two houses opposite each other. One house, built around 1740, was HAUS 08, the home of Johann and Elisabeth Bitter Drüecke from 1790 to 1798, and their descendants thereafter. The other house, built in 1786, was a half-timbered structure built by Johann Drüeke prior to his marriage to Elisabeth Bitter. The structures are now owned by two brothers, Andre and Markus Eckert, who are renovating them for use as their own homes. The two brothers just happened to be there when we arrived and gave us a tour. I saw a framed picture on the wall in the hallway of the 1740 house that looked like a painting of the two houses. Markus confirmed that it was and asked us to wait while he went into another room and came back with a tube about four feet in length with an enlarged photograph of the painting wrapped around it in bubbble-wrap. He gave it to me and told me to could keep it. Fortunately, Lufthansa was happy to check it in with our luggage on our way home 10 days later. The original is about two feet wide, half the size of the enlargement. The image shown above was found on the Ostentrop Web site after we returned. Also on the wall in the hallway of the 1740 house were photographs of the house as a restaurant run by the Kaufmann family. Needless to say, this was the high point of the genealogical portion of our trip! Pastor Rinschen's history of HAUS 08 enabled me upon return home to research and write a family history of Johann and Elisabeth Bitter Drüecke. It not only provided ancestral infomation for my family but also led to the discovery of distant cousins who had immigrated to Chanhassen, Minnesota, and Milwaukee, Wisconsin, in the United States. It also led to an explanation of the connection between my family in Grand Rapids and another one that we knew must be related but did not know how. The third horizontal timber on the home built by Johann Drüecke in Ostentrop in 1786. In Latin and German, it reads in English: "All for the Greater Glory of God." 2007 photo of home built by Johann Drüecke in Ostentrop in 1786. A larger image shows the first horizontal timber from the top are in Latin and in English reads "Do Right, Fear No One." The third horizontal timber is in Latin and German and in English reads "All for the Honor and Glory of God." The seventh horizontal timber contains a poem about truth and justice. Below the middle window is a cross above a heart and the monogram IHS for Jesus. 2007 photo of Drüecke houses in Ostentrop at the intersection of Mittelweg and St. Lucia Straße. The 1786 house is on the left, and the 1740 house is on the right. 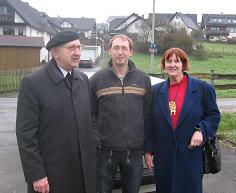 Pastor Franz Rinschen, Markus Eckert, Marilyn Biggins in Ostentrop. March 2007. 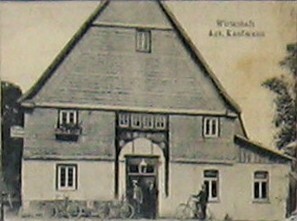 1740 Ostentrop house as the Kaufmann Wirtschaft (restaurant), with bicycle riders. 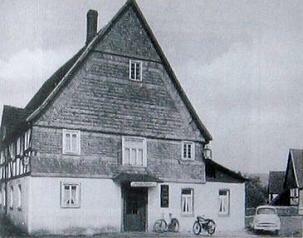 1740 Ostentrop house, with bicycle, motorcycle, and automobile. 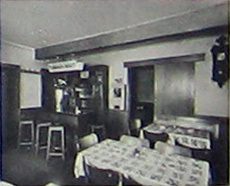 Restaurant in 1740 Ostentrop house. 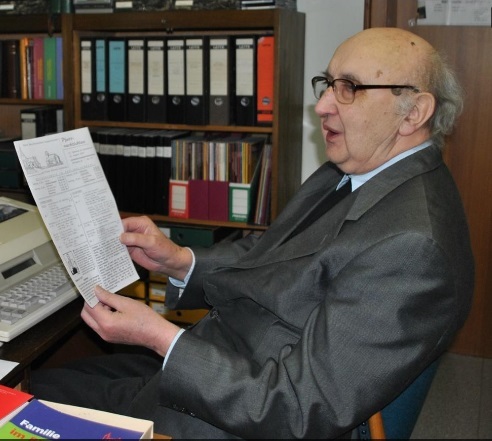 Pastor Franz Rinschen (1927-2017) working on a weekly parish bulletin. 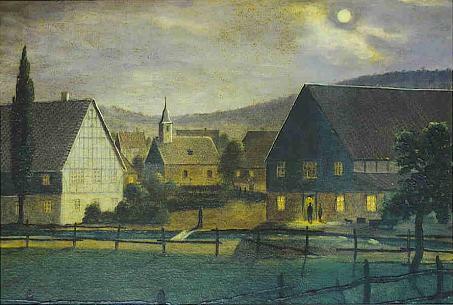 Franz Rinschen was born in 1927 in Fürstenberg (35 miles east of Paderborn) and moved to Attendorn. He was ordained in 1953 by Lorenz Cardinal Jäger in in Paderborn. In 1968, he became pastor of Mariä Himmelfahrt (Assumption) Church in Schönholthausen. His sister Josefine moved into the in the rectory with him. The parish includes St. Luzia in Ostentrop. He died February 1, 2017, and was buried next to the church sacristy. Photo by Friedhelm Tomba. Obituary: February 3 On-Line, February 4 E-Paper. Announcement February 8 E-Paper. Following is Pastor Rinschen's 1998 history of the 1740 house designated as HAUS 08. It appears on pages 39-43 of Families and Houses of Ostentrop. Pastor Rinschen's history has been translated by Mark Riggleman, who found this page when his Y-DNA matched up with my cousin Paul Drueke in December 2016. Before that a small part had been translated by Suellen Griffin Valdes, daughter of my Drueke cousin James Griffin. Note: * means born. oo means married. + means died. N. N. means no name. Die erste Erwähnung eines Kottens Krämer findet sich 1599 so: Peter Stracke, Bruder des Ewiger Pächters Jakob, verkauft eine früher zu SCHÜRTEN GUT gehorende Kottenstätte mit Haus an Jakob Müller, genannt Krämer. (Heimatborn 13,1936,S.2f.). Aus „Güter und Rechte des ehemaligen Klosters Ewig" von N.Scheele will ich dieseinteressante Geschichte weitergeben: Im Jahre 1599 hat Peter Stracke, seligen Jakobs, unseres Colons, Bruder, ohne des Grundherrn Wissen und Willen das bei der genannten Kottenstätte erbaute Haus gegen eine gewisse Summe Geldes dem Joan Möller, genannt Krämer, erblich verkauft. Dieser hat im Jahre 1620 Haus und Hof dem Pastor zu Schönholthausen, Wilhelm Tütel, ohne unsere Zustimmung eingeholt zu haben, folglich nichtig, wieder veräußert, dabei aber die Wiederlöse mit Erlegung von 28 gemeinen Talern sich vorbehalten. Als nun nach Ablauf einiger Jahre genannter Pastor wegen seiner vorgeschossener Gelder das Haus einziehen wollte, die darauf wohnende Witwe vertreiben und einem anderen die Sache verheuern, ist die Sache zum Rechtsstreit geworden und - nachdem beide Parteien verhört wurden - ist für Recht erkannt, daß das Kloster Ewig als Besitzer anzuerkennen sei, womit sich der Pastor für sich und seine Erben abgefunden und verzichtet hat. Nach W.Voß' Hofskizzen S.130 kommt der Name Kremer vor mit dem Zusatz „arm". Später werden genannt: 1649 und 1664 Peter Krämer, ein Kötter; 1685 Johann Kremer und seine Frau Trine; 1717 Krämer und Frau. Soweit Voß. I want to pass along this interesting story from “Güter und Rechte des ehemaligen Klosters Ewig" (“Holdings and Rights of the former Ewig Monastery”) by N.Scheele: in 1599 Peter Stracke, the brother of blessed Jakob (our tenant farmer), without the knowledge and will of the landlord, sold for posterity the house that was built on the aforementioned property to a Joan (read: Johan) Moller, called Joan Krämer, for a certain sum of money. 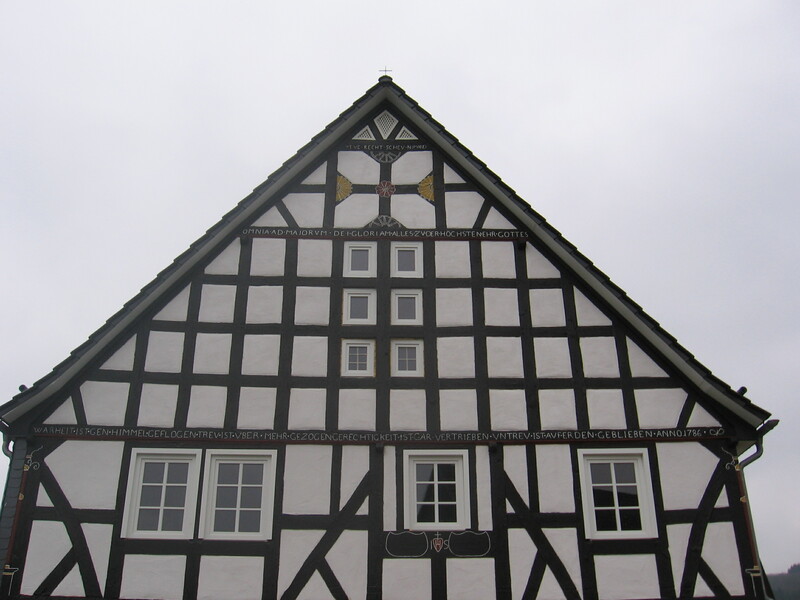 In 1620 Joan Moeller resold the house and property to the Pastor of Schoenholthausen, Wilhelm Tütel, without having asked for our permission (making it null and void) but the property was reserved by laying down 28 Thalers. When, after a few years, the aforementioned pastor wanted to move into the house on account of the money he had advanced and drive out the widow who was living there and rent it to someone else, the situation became a legal battle and – after both parties testified – Monastery Ewig was recognized as a matter of law as the owner of the property, whereby the pastor resigned and renounced his claims and those of his heirs. The name “Kremer” appears in W. Voss’ Hofskizzen (Farmyard Sketches) on page 130 with the notation “poor”. Later mentions are made of: Peter Krämer, a tenant farmer, in 1649 and in 1664; Johann Kremer and his wife Trine in 1685; Krämer and wife in 1717. Information from Voss to this point. ANTON KREMER und ELISABETH N. N.
18.01.1711 Anna Maria, oo 31.6.1755 Johan Engelbert Lennemann, Habbecke. 24.03.1715 Heinrich, ERBE, siehe unten. 20.04.1721 Johann Theodor, + 2.10.1733. 17.04.1724 Elisabeth, oo 31.4.1732 Heinrich Eickhoff (HAUS 30). Bisher fristete Kremers Kotten eher ein bescheidenes Dasein. Bei der Sammlung für den Kirchbau konnten Kremers nur 2 Gulden versprechen und 12 Petermännchen mitgeben (1733), zudem war ein Viertel Meßhafer (= 20 Liter) eine geringe Abgabe an die Kirche, so änderte sich das sehr, als Sohn Heinrich (oben Kind 3) die Anna Margarethe Kallenstein aus Schönholthausen heiratete. Sie war, wie alle Kallensteins Kinder, vom Vater gut ausgestattet. Am Gericht Schliprüthen konnte Heinrich sogar Schöffe werden. ANTON KREMER and ELISABETH N.N. 3/24/1715 Heinrich, HEIR, see below. 4/20/1721	Johann Theodor + 10/2/1733. To this point the Kremer household eked at a very basic existence. At the collection for building the church the Kremers could only promise 2 Guilders and give 12 silver coins with it; in addition there was a quarter of a donation of oats (= 20 Liters) – a very modest delivery to the church. Circumstances changed significantly when Heinrich (child 3 above) married Anna Margarethe Kallenstein of Schoenholthausen on 5.22.1742. She was well provided for by her father, as were all of Kallenstein’s children. At the court of Schlipruethen Henry was even able to become a juror/judge. 17.02.1743 Maria Margarethe, früh gestorben. 31.01.1745 Maria Agnes, früh gestorben. 01.11.1746 Maria Katharina, früh gestorben. 10.05.1750 Johann Adolph, früh gestorben. 29.06.1752 Franz Joseph, + 3.12.1766. 01.12.1755 Maria Elisabeth,	ERBIN, siehe unten. So blieb nach dem Tode des Vaters am 18.11.1786 und der Mutter am 23.2.1795 nur Elisabeth übrig. Sie holte sich ihren Mann aus Elspe: Johan Börger, * ca. 1743. Er nannte sich zunächst Krämer, später Drüecke. (Niemand frage mich aber, warum und wieso). Geheiratet haben die beiden am 10.6.1776. 12/1/1755 Maria Elisabeth, HEIRESS, see below. So only Elisabeth remained after the death of her father on 11/18/1786 and her mother on 2/23/1795. She fetched her husband from Elspe: Johan Börger, born c. 1743. He called himself Krämer next, later Druecke. (But don’t ask me why). The two married on June 10 1776. JOHAN DRÜECKE und MARIA ELISABETH KREMER. Ohne Kinder zu bekommen, starb Maria Elisabeth am 1. 4.1790. Johann heiratete schon wenige Wochen später, am 25.5.1790, Maria Elisabeth Bitter, * 12.12.1770 in Fretter, (+ 2.5.1835). Mit ihr kam eine geschaftstüchtige Frau ins Haus, typisch für Bittern in Fretter. JOHAN DRÜECKE and MARIA ELISABETH KREMER. Maria Elisabeth died on 4.1.1790 without issue. Johann married Maria Elisabeth Bitter a few weeks later on 5.25.1790, *12.12.1770 in Fretter, (+5.2.1835). She was a woman efficient at business, typical of the Bitter family in Fretter. JOHAN DRÜECKE und MARIA ELISABETH BITTER. 24.07.1791 Johann Joseph, ERBE, siehe unten. 01.07.1797 Maria Katharina, oo 25.6.1821 Franz Anton Gottschalk nach Seitfeld. Unser Johann ist am 4.5.1798, 55 Jahre jung, gestorben. Maria Elisabeth heiratete erneut, und zwar am 27.12.1798, den Ferdinand Wortmann aus Lenhausen, verließ mit ihm Ostentrop (warum ist nicht bekannt) und zog nach Binolen bei Balve. Wie es heißt, hatte sie dort noch einmal zwei Sohne. JOHAN DRÜECKE and MARIA ELISABETH BITTER. During this marriage the business ledger, which was preserved in the pastor’s archive, states that Johann Drüecke conducted complex and comprehensive business ventures that branched out into many different directions. For example, he delivered and transported merchandise, between Münsterland and Frankfurt and displayed at trade shows. Even Seltzer water was one of the goods being transported. I will often refer to this ledger, as it contains important information for us “between the lines”. With Johann, who was also a jury member*, and his second wife, the former cottage reached the size of a stately home, so that their son could proudly call himself an estate owner. 7/24/1791 Johann Joseph, HEIR, see below. 7/1/1797 Maria Katharina, oo 06.25.1821 Franz Anton Gottschalk moved to Seitfeld. Our Johann died on 5.4.1798 at 55 years young. Maria Elisabeth remarried on 12.27.1798 – a Ferdinand Wortmann from Lenhausen, leaving Ostentrop with him (the reason why is unknown) and moved to Binolen bei Balve. Supposedly they had two sons there. As stated above, the son Johann Joseph (Child 1 above) inherited the farm. He married Antonette Margarethe Gottschalk, called Schulte, from Seitfeld on 11.6.1821. She had been his sister-in-law before then. He died, incidentally, on 3.14.1869, his wife on 10.16.1849. But we want to get to know the family first. *Translator’s note: in medieval Germany, legal cases were tried before 12 “Schoeffe” who functioned as both judge and jury. Only in the early modern era were they replaced by judges who had studied law and were specialists. In the countryside the traditional practice remained in force for some time after cities had switched to specialized judges. 20.07.1823 Johann Wilhelm, ERBE, siehe unten. 02.01.1825 Maria Katharina, oo 26.11.1844 Anton Haggen (HAUS 09). 28.10.1826 Franz Carl,nach Amerika ausgewande. 14.04.1835 Anna Theresia, + 1837. Als Erbe auf dem Hof erscheint der Sohn Johann Willhelm (Oben Kind 1), der am 16.8.1853 Lisette Korte aus Fehrenbracht geheiratet hat. Sie soll am 25.8. 1830 geboren sein, gestorben am 30.3.1890. 7/20/1823 Johann Wilhelm, HEIR, see below. 1/2/1825 Maria Katharina, oo 26.11.1844 Anton Haggen (HOUSE 09). 4/14/1835 Anna Theresia, + 1837. The son Johann Wilhelm (Child 1 above) is the heir of the farm. He married Lisette Korte from Fehrenbacht on 8.16.1853. She was supposedly born on 8.25.1830, died on 3.30.1890. JOHANN WILHELM DRÜECKE und LISETTE KORTE. 29.03.1857 Carl Ferdinand, nach Amerika ausgew. ? 02.09.1865 Franz Anton, + 1868. 14.04.1868 Maria Elisabeth, + 1868, Vater ist Landwirt genannt. W.Voß vermerkt in seinen Hofskizzen: „In der zweiten Hälfte des vorigen Jahrhunderts wurde der Hof parzellenweise verkauft". JOHANN WILHELM DRÜECKE and LISETTE KORTE. Johann Wilhelm became a farmer during his “time in office” as landowner; in 1882 he is also listed as a “publican”. See “Deimel” on the following page. Around 1880 he resolved the transfer issue with the pastor. As for when he died, we don’t know. But we do know his children. 3/29/1857 Carl Ferdinand, emigrated to America? 9/2/1865 Franz Anton, + 1868. Here I must insert a “puzzle”: On 8.16.1803 a Johann Franz Bernhard Deimel from Schönholthausen married an Anna Elisabeth Schürmann from Deutmecke. Their first 6 children were born in Ostentrop. He is described as a farmer as well as (in 1808) a “restaurateur”. Sometimes he is named “Pachter”. Curiously, he is sometimes also called “Cremer”. In my opinion, this last name can only indicate that he had settled here at the Kremers-Drüken House. If he is also the one who first tried to make it as an “restaurateur” at this location? In any case in 1821 when the 7 children were born, the Deimel family was already living in Deutmecke. I think, I should still introduce this family. FRANZ DEIMEL und ANNA ELISABETH SCHÜRMANN. 24.01.1806	Maria Theresia, + 1820. 15.02.1808	wieder Franz Joseph, + 1809. 20.06.1821	Anton, * in Deutmeake. Elisabeth, (oben Kind 5) hat am 31.1.1837 Theodor Scheermann in Müllen geheiratet. Nach diesem Zwischenspiel wieder auf den Hofplatz zuruck. Im Verlauf des Ausverkaufs bei Drüken (so wird es inzwischen geschrieben) haben Kaufmanns aus dem Nachbarhaus wohl zugegriffen. Von Wilhelm Drüke (siehe Vorseite) übernahmen sie die „Deimel-Grundung" der Gastronomie. Jedenfalls war Frau 5imonis als geborene Kaufmann mit ihrem Mann Jakob die letzte Wirtsfamilie auf dem Hofplatz. Franz Joseph Drüke (oben Kind 7) finden wir dann als Bauern in Schönholthausen wieder, seit dem 22.10.1895 verheiratet mit Anna Luise Lubeley aus Weringhausen. So endet diese Hofgeschichte in Ostentrop, und wir erlebten einen großen Aufstieg und auch einen Untergang; das Schicksal so mancher Höfe in unserer Heimat. FRANZ DEIMEL and ANNA ELISABETH SCHÜRMANN. 1/24/1806 Maria Theresia, + 1820. 2/15/1808 another Franz Joseph, + 1809. 6/20/1821 Anton, * in Deutmeuke. Elisabeth, (Child 5 above) married 31.1.1837 Theodor Scheermann in Müllen on 1.13.1837. Back to the farm after this interlude. In the course of this sell-off by the Drüke family (this is how it came to be spelled), the Kaufmann family from the neighboring house pounced. They took over the restaurant from Wilhelm Drüke (see previous page). In any case, Mrs. Simonis (nee Kaufmann) and her husband Jakob were the last innkeeper family at the location. We find Franz Joseph Drüke (Child 7 above) once again as a farmer in Schönholthausen, married since 10.22.1895 with Anna Luise Lubeley from Weringhausen. So ends the history of this farm in Ostentrop and we experienced a big upswing and a decline as well; the fate of so many farms in our hometown.